This article written by Chess at Three co-founder Tyler Schwartz first appeared on lichess.org. To understand the benefits of playing chess, think of chess as a mental gym. When you play chess, you engage your brain in critical and demanding ways. Your brain is constantly developing to adapt to this more mentally intense environnment. Thus when you repeatedly play chess you get, well… smarter. Memory, critical thinking, calculation, mental dexterity and executive function in early childhood are just some of the wonderful benefits of playing the game of kings. The article later goes on to tell the stories of amazing women who have accomplished impressive feats in chess. But as amazing as these women are and as lucky as the (chess) world is to have them, their presence in chess feels like an exception. My daughter turned 1 yesterday. For a present I gave her a plastic chess set, with the felt and glue scraped off the bottom of the pieces, so my daughter could safely chew on them. I want her to grow up around a different chess culture where female presence in chess isn’t the exception. How do we turn the tide? Let’s start with some data from people who care about making money off children by selling toys to them. In 2011 a blogger named Crystal Smith did an audit of words used in children’s toy commercials. Were there significant differences between common words on boy’s toys, and girls toy’s? For girls toys there are 3 popular words that are consistently used to get girls excited to buy their product: friendship, fun and magic. For boys, there’s one word that is most popular by far: battle. Before we go any further I’d like to posit an opinion and change the question: How do I get my Daughter to love Chess? Author’s Opinion: I’ve taught 1,000’s of children over the past 8 years, from ages 2-18. In general I’ve found boys to be more competitive than their female counterparts. With that said, the most competitive student I’ve ever had was a girl who would snarl when she lost; I was and still am mildly afraid of her. Not all boys are competitive, not all girls aren’t. 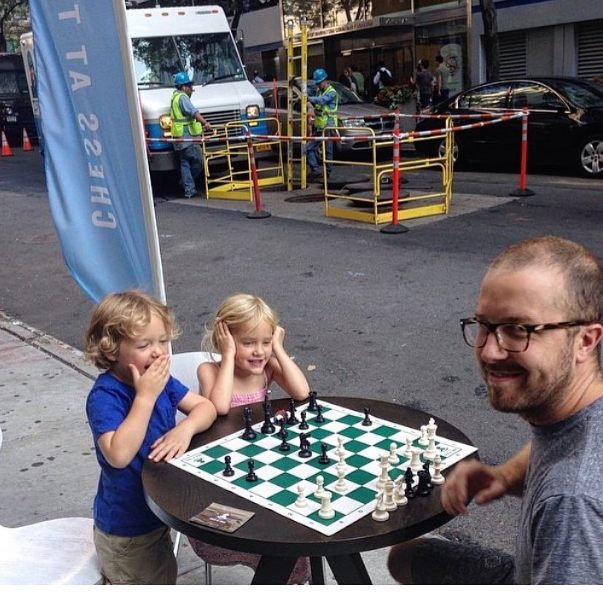 To answer the question “How do I get my Daugher to love Chess?” I want to change the question to: “How do I get someone who isn’t competitve to love chess?” I’m not assuming my daughter isn’t competitive, as it’s very difficult to tell at the tender age of 365 days, I’m simply planning out a variation that could happen in her life. I am a simple man. I am competitive. I want to beat you in chess. If you beat me I will feel rotten. How do I get better? I observe how you play, go home, study your “game”, and come back in one month and try to beat you. If I lose, I study more – until I win. Competition is the gas in my engine. But I’ve played many students, both male and female, beat them in a game of chess and they don’t care. They just shrug their shoulders and wonder what is next. “That was fun.” They say. These children’s “engine” is different than mine, it doesn’t run on “competition”. This conversation is much more complex than competitive vs non-competitive. There are endless reasons or motivations for someone to excel at chess. Tennis legend Andre Agassi hates tennis. In his autobiography, he reveals his main motivation for excelling at tennis was to earn the admiration of his father. I have students who are amazing at chess, but they excel because they love being “correct”. Making the correct move, playing the first 25 moves of the Ruy Lopez Marshall Attack perfectly. These children play chess because they love to follow the rules. But some people play chess for the opposite reason. Take World Chess Champion Mikhail Tal, he reveled in not making the “correct” move and famously said: “There are two types of sacrifies: correct ones, and mine.” Controversial chess legend Bobby Fischer had more pernicious motivations. When asked about his favorite moment in a chess game he replied, “I like the moment when I break a man’s ego.” Countless men play golf to “get away from it all” and find playing relaxing, never entertaining thoughts of ever winning a tournament. But in the face of seemingly infinite motivations, I’ve found the competitive vs non-competitive dichotomy a good place to start. I don’t think competitive children need motivation as much as direction. They will happily work. Your primary job as a teacher will be giving them the most efficent path to their goal. Then enjoy watching them run down that path. But what about the student that didn’t care they lost a game of chess? The pain of a loss is what inspires better performance in a lot of people, but to non-competitive students it rolls off their ego without a mark. I believe this is the many girls and boys. They might learn chess, but at a certain point, without a competitive motor or a deep love of the word “battle” or a tutor that can continually inspire them, their interest quickly wanes. I’d also like to add being non-competitive isn’t “better” or “worse” than being competitive. They are simply two very different motors, and I want to begin to work on a ‘method’ for the more non-competitive. Clues to inspire less competitive students lie in: Friendship, magic, and fun. Whenever I teach a non-competitive student, boy or girl, I always incorporate: friendship, magic, and fun. The most potent I’ve experienced is friendship. C.S. Lewis describes friendship as two people walking together towards a common goal. We want the common goal to be: getting better at chess. So when I have a student that isn’t competitive and I want them to excel, I invite them to help me get better at chess. I tell them I don’t understand a chess position, I have trouble remembering an opening, or can’t beat rival at a local chess tournament. “Can you help me?” I’ll ask the student. Then the student sees a friend in need and wants to help them. The context of the lesson has been changed from battle to two friends walking a path together. The content doesn’t change, the presentation of it does. You still can use puzzles, analyzing games, opening theory, but still present the information in a way where the student is helping you. What about magic, and fun? More on that later. What’s important is changing the mindset of how you present information and build a world for your more non-competitive students, boy or girl.